The mighty outer space. Yes, the whole of the cosmos we have been living in; the very reason of our existence. For quenching the thirst of knowledge and for finding a suitable justification to the curiosity Man possesses, the research about this never-ending entity began from before the earliest of times. The man tried to reach for the stars and thus, the space exploration field got a big boom. We all know the present peak point Man has reached in space exploration because of His struggle for more. Although the numbers may be less than expectations, astronauts have been to the ISS (International Space Station) and to the Moon and have gone for spacewalks in not more than five decades. That is a highly appreciable evolution of the whole of humanity which did not even have anything for a flight within the atmosphere half a century before that. Even after such mighty accomplishments, the space is not yielding its secrets so easily. Astronauts are faced with different challenges the Universe poses and maintains nearly every day. Such a fine example of it has been this bizarre phenomenon cosmonauts and astronauts face when they return from spacewalks. The crewmembers in outer space have reported odd smells and a pungent odor on returning back to the ISS. Unbelievable as it may sound, our space has, after all, a characteristic smell—or so we think. The most interesting thing about this odd smell is that the astronauts do not feel it when they are actually in space, rather they experience it once they remove their helmets inside the ISS. Some of them have reported that their helmets, shoes, gloves and tools had a whiff of the particular smell, probably a clinging remnant. The other astronauts, when approached for comments, said that they couldn’t agree more to the description of Pettit. However, in addition to that they have said that they also felt the smell of seared meat or steak, ozone reminiscence, hot metal, diesel fumes, barbecue and welding fumes. 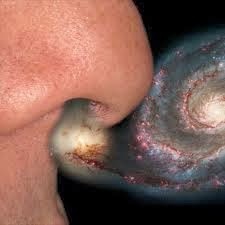 So is this what space smells like? A horrible mixture of burning smells? Can it be possible for an entity to be physically void and have a characteristic that could trigger the olfactory senses (sense of smell) after all? NASA approached him for the creation of the smell on Earth for astronaut training sessions. Certain particles from the dead star's debris, the Big Bang debris, stray atomic oxygen molecules and high vibrating ions are thought to be the reason behind this smell. These particles are named as ‘polycyclic aromatic hydrocarbons’. These hydrocarbons stick to the astronaut spacesuits when they get out for space walks or for repairing the station and gets sneaked in the station with them. The reason astronauts cannot feel this smell during their space ventures is because of the plastic-y smell the space-suits hold and also because of the pressurized oxygen from the cylinders. This observation is not wrong. A recent study suggests that once we get out of our solar system, the smells vary. The center of our galaxy has been observed to be composed largely of ether which is also a key component of raspberries and rum. It indicates that the center of galaxy smells like raspberries and rum. All in all, if space is filled with rotten meat and diesel stench and smell of raspberry and rum, then it is the most poisonously stinky places human beings have ever come across.